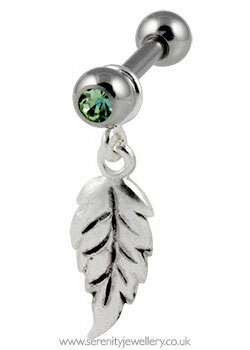 9mm sterling silver or silver plated brass hanging leaf charm on a 6mm or 8mm barbell with 3mm screw-on peridot (green) crystal jewelled ball closure on the front and plain screw-on ball on the back. 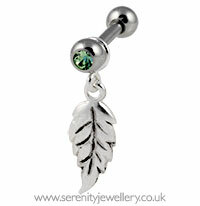 Post length Cartilage studs are not adjustable so you need to choose the length of the post. How do I work out the length? This is pretty and delicate, however I've not managed to get it in yet! I need help from my daughter as it's a bit fiddly getting the bar through, keeping the leaf on and putting the ball back on! Can't wait to give it another go though! Beautiful earring, great item and really affordable price. Very dainty looking stud and gentle leaf,quite a few people ask where i got it from. Very happy with this item. Amazing and unique earring which I get loads of compliments on when I wear it. I'll be back!